Elephants are large land mammals in two extant genera of the family Elephantidae: Elephas and Loxodonta, with the third genus Mammuthus extinct. Three living species of elephant are recognized: the African bush elephant, the African forest elephant and the Indian or Asian elephant; although some group the two African species into one and some researchers also postulate the existence of a fourth species in West Africa. All other species and genera of Elephantidae are extinct. Most have been extinct since the last ice age, although dwarf forms of mammoths might have survived as late as 2,000 BCE. Elephants and other Elephantidae were once classified with other thick-skinned animals in a now invalid order, Pachydermata. Elephants are the largest living land animals on Earth today. The elephant's gestation period is 22 months, the longest of any land animal. 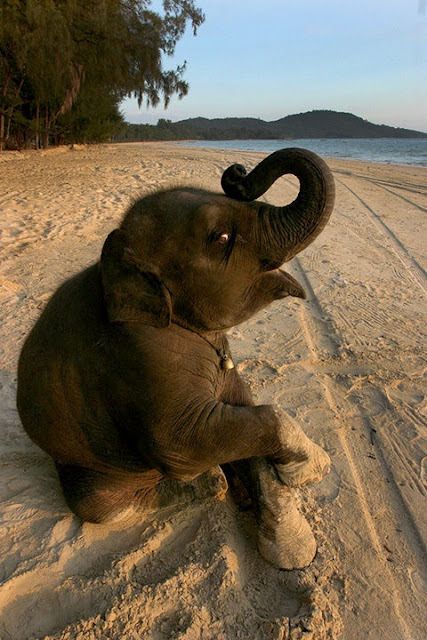 At birth, an elephant calf typically weighs 105 kilograms (230 lb). They typically live for 50 to 70 years, but the oldest recorded elephant lived for 82 years. The largest elephant ever recorded was shot in Angola in 1974. This male weighed about 10,900 kg (24,000 lb) with a shoulder height of 3.96 metres (13.0 ft). The smallest elephants, about the size of a calf or a large pig, were a prehistoric species that lived on the island of Crete during the Pleistocene epoch. Elephants are a symbol of wisdom in Asian cultures and are famed for their memory and intelligence; their intelligence level is thought to be comparable to that of dolphins and primates. Aristotle once said the elephant was "the beast which passeth all others in wit and mind." The word "elephant" has its origins in the Greek ἐλέφας, meaning "ivory" or "elephant". Healthy adult elephants have no natural predators, although lions may take calves or weak individuals. They are, however, threatened by human intrusion and poaching.